I was asked on Quora - What is the difference between outward orientation and free trade? This is based on the neoclassical theory which deem the 2 concepts interchangeably. I have no idea what you mean by "outward orientation and free trade - based on neoclassical theory which deem the 2 concepts interchangeably." As I have said in the past, the process branded as free trade as it is today is not free trade as historically practiced and defined. So called free trade is not trade. It is an economic system set up to divorce production from investments and move production anywhere in the world for the sake of cheaper labor and for more profits for just a few. It isolates the free market for only a few to enjoy too. Powerful elite forces use it as a way to control the flow of wealth and power throughout the world too. One investor likes to say - or you will be crushed like the cockroach you are. The same applies to most business models big and small in the free trade world. Somewhere along the line the process was branded as free trade. But the main commodities being traded are workers who are put on a global trading block to compete with one another for the same jobs down to the lowest levels of wage slave and even child labor. With more than a billion people in the world willing to work for practically nothing to survive, it is indeed a race to the bottom. Governments enter the picture as brokers and dealers in a global economic arena. This short circuits what world trade is all about. Trade is supposedly about deals with individual entities and not governments. Governments including international entities get involved for other reasons too. They use the free trade process as a way to control world events. And nations finding their interests spread across the globe find they must use force to protect their interests. This results into a new form of colonialism on a global basis. Wars follow and apparently are part of the process itself. We do not need any conspiracy theories to know free trade economics is driven by powerful forces outside the will of the people who have ulterior motives for their participation in the process. 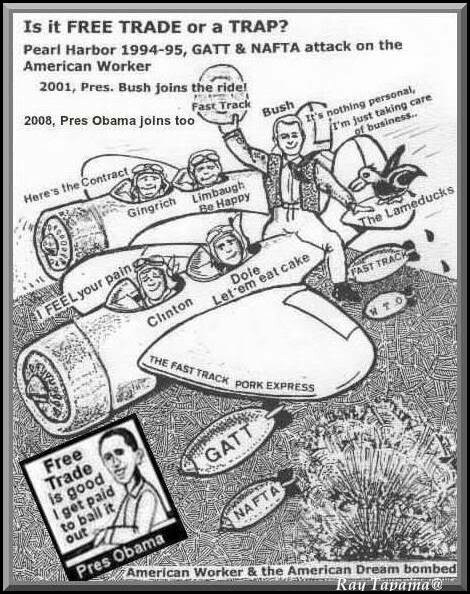 They use free trade as a way to globalize the world into some kind of one size fits all one world government. They apparently want the sovereignty of individual nations to be under a centralized system. President Obama used the term New World Order at least two times at international money conferences and shows how closely power, money and politics are combined in the free trade economic system on a global scale. With the new super trade bills the details of the process are now openly in the text of these agreements. Instead of asking questions about free trade, someone needs to ask the world financial community what the term New World Order stands for. And here is how I expressed myself in an editorial cartoon that was first published in 1994 with President Bush and President Obama added later. And less we forget, President Obama had to bail out the process in 2008 by borrowing trillions of dollars from the future. This in effect put tariffs on future generations of workers.